For the passed few days its been so hot and humid, to-day the skies are clear and blue with a nice breeze..Gotta love Australian weather.. I am so jealous of everyone who is living in a place with cold and snow!!! I know that it is really hot and humid, heatwave conditions in my hometown. Worst thing is, it is still with no wind as well. Where I am staying, it is hot but there is a nice breeze. Hoping the breeze will follow me home!!! Right now, its 34°, and it's supposed to pretty much stay that way, give or take a couple of degrees, for the next week. We were SUPPOSED to have 3-5 inches of snow--we got MAYBE 1 inch. I seem to remember getting pretty decent snowfall here when I was a kid, but for the past few years, it's been pretty depressing. I am so jealous of everyone who is living in a place with cold and snow!!! Well, look at it this way. If you were to fall asleep outside, you might have bug bites when you woke up...but you would wake up. If I were to fall asleep outside, I would die. Hope that helps. Some days it is a bit cold and some days it is a bit warmer. There has been some snow, but not much. I hope that it doesn't get much colder. Being far too bright and sunny for February. SNOW. I'm beginning to think I'm making it happen; every time I shovel, IT SNOWS AGAIN. I'm seriously considering this hibernation thing the other animals have going on. It's snowing all the time here too. I can honestly say that I AM DONE with winter!! Stupid, unreasonably cold weather! COLD. Yesterday it was around 8 degrees Fahrenheit. Today it's 12 degrees. This is ridiculous! I split wood yesterday (in the garage to keep out of the wind...yes, there was wind, too ), and there is enough for tonight, so I think I'm going to skip a day, since tomorrow is supposed to be a balmy 28 degrees. It's fog and rain here in Oregon. We've gotten a lot of flood warnings and dense fog advisories. Hmmm this is true!!! It is 9am and I am already sweating today... Winter is coming, winter is coming... My mantra! I'm guessing that you're in Australia? Poke a kangaroo for me? Well, now it's just stupid cold. 1 degree Fahrenheit, and wind. Fortunately, I split a lot of wood yesterday, so I don't have to go out in it today. 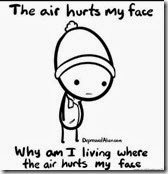 With the windchill, it's -33*F outside right now. It's dropping to -40*F by this eve/ tonight. This is a level of cold that's going well beyond what this Canadian is willing to handle. And if I had my way, I'd be hibernating until Spring at this point! But alas, I need to work tonight, and that requires bus travel. And I'll have to time myself very carefully because the buses are on a reduced schedule on Sundays. Erm... Anyone interested in swapping places for a couple of days? It's February and already 80 degrees Fahrenheit. *frowns* WINTER COME BACK! We aren't ready for summer yet! P.S. Tisiel, I'll gladly trade places with you.